In this experiment, we used our Conflict Alleyway Apparatus and a glucocorticoid antagonist, mifepristone, to investigate the role of glucocorticoids in the reconsolidation of learned avoidance in defeated male Syrian hamsters. Subjects were tested for memory deficits 48 hours and 96 hours after the drug/vehicle was administered. It were hypothesized that mifepristone administration would produce memory deficits when the defeat memory had been reactivated, and that this deficit would be present 48 hours and 96 hours after the administration. Prolonged deficits that are dependent upon memory reactivation would suggest that glucocorticoids play a role in reconsolidation of learned avoidance. Our results indicated a strong evidence for learned avoidance after defeat; however, we did not find any significant drug effect. Previous research measuring stress in animal models has typically used electric shocks as a stressor (Pitman et al., 2011; Taubenfeld, Riceberg, New, & Alberini, 2009; Walters & Abel, 1971). However, we believe that social stress is a more naturalistic stressor. One such method for inducing social stress is social defeat, which involves an aggressive encounter between two animals and the creation of a subordinate-dominant relationship (McCann & Huhman, 2012). When single-housed male Syrian hamsters are paired together, they typically, and mostly without provocation, engage in agonistic behavior (i.e., submissive, defensive, and aggressive behavior) and establish a dominant-subordinate relationship. In future encounters, the subordinate will typically display a high frequency and long duration of submissive and defensive behavior (e.g., teeth chattering, fleeing, a defensive posture and a lifted tail). These behaviors are not typically seen prior to defeat and are labeled conditioned defeat (Huhman, 2006; McCann & Huhman, 2012). Encounters between male Syrian hamsters rarely result in injuries and they frequently display agonistic behavior. This makes them a suitable model for studying social stress (McCann & Huhman, 2012). Lai and Johnston (2002) indicate that subordinate hamsters will avoid their dominant opponents after an aggressive encounter. They found evidence for individual recognition, in that defeated hamsters avoided the hamsters that had defeated them, but not an unfamiliar dominant. In addition, this avoidance of their dominant opponent lasted at least seven days after encounters. These findings have in part been replicated using our conflict alleyway, an alleyway with seven chambers that decrease in illumination (i.e., from 1500 lux to 2 lux) and contain an arena that holds a dominant opponent behind a barrier at the end of the alleyway. This study showed learned avoidance in defeated subjects (Cullum & Askew, 2012). When a memory is stored it is theorized to go through a process known as consolidation. This refers to a process in which the memory is transformed from an unstable state to a stable state (Dudai, 2004; Pitman et al., 2011). The argument for this is based on experiments where memory formation is disrupted right after a situation is presented. The disruption can, for instance, be due to distracting stimuli, injuries or toxins (Dudai, 2004). Relatively recently, reconsolidation has become the focus of research. Reconsolidation theory suggests that when a memory is retrieved from a stable state under certain circumstances, it will return to an unstable state, from which it must be reconsolidated (i.e., turned back into a stable state) in order for it to sustain (Pitman, 2011). In research dealing with reconsolidation, it is important to be sure that it is reconsolidation that is being investigated rather than extinction, a process in which new learning inhibits previously learned material (Pitman et al., 2011). Pitman et al. (2011) argue that when a memory is extinguished, it may be recovered through a reexposure to the unconditioned stimulus alone, or with the passage of time. On the other hand, it has been suggested that a memory that has undergone reconsolidation blockage is not recoverable, because the memory is thought to be erased, not extinguished. In summary, reconsolidation alters an already existing memory and a disruption of this process leads to amnesia (Pitman, 2011). Tronel and Alberini (2007) indicated that recall of a fearful memory was disrupted if glucocorticoid receptors were inactivated in the basolateral amygdala with the use of mifepristone after an earlier memory recall. Jin, Lu, Yang, Ma, and Li (2007) demonstrated that amnesia did not occur if the retrieval was omitted or if the drug was administered six hours post-retrieval. They also showed that post-retrieval produced no deficit in the drug induced post-retrieval short-term memory. However, it impaired post-retrieval in long-term memory and the amnesia did not display any spontaneous recovery six days after retrieval. Pitman et al. (2011) described how administration of certain reconsolidation-blocking drugs shortly after memory reactivation produced memory deficits in subsequent testing. One such reconsolidation-blocking drug is mifepristone, a glucocorticoid antagonist that is considered a safe U.S. Food and Drug Administration approved medication and is most well-known for its use in the termination of pregnancy (Pitman et al., 2011; Taubenfeld et al., 2009). Taubenfeld et al. (2009) used inhibitory avoidance as a model of traumatic memory. In this experiment, rats learned to avoid a context that had previously been paired with foot shock. They found that systematic administration of mifepristone (30 mg/kg) immediately after the first test trial (Test 1) of learned avoidance persistently disrupted the reconsolidation of the established fear memory (i.e., a decreased latency to enter the shock chamber) measured during subsequent trials conducted 48 hours and one week later. The memory did not reemerge after a reminder foot shock. They also tested whether the treatment was dependent on memory reactivation by injecting mifepristone (SC) 48 hours after training without Test 1. At the second test trial (Test 2) of learned avoidance 96 hours after training, they found no significant effect of mifepristone in the absence of reactivation compared to vehicle-injected control animals. Taubenfeld et al. (2009) argue that when mifepristone is given after retrieval (Test 1), it targets memory reconsolidation and therefore ultimately the storage of information. They found mifepristone’s effect was significant and persistent whether it was administered before or after initial memory retrieval, suggesting that an extended time window of treatment around the retrieval trial exists. However, administration before the initial retrieval (Test 1) did not affect the recall of the memory itself, a condition necessary for the treatment to be effective and disrupt memory reconsolidation. Deębiec, Doyère, Nader, and LeDoux (2006) argue that memories are often interrelated in complex associative networks rather than stored in isolation. They considered whether the reactivation of one memory also requires the reconsolidation of associated memories and tested this by making interlinked associative memories (i.e., associations linked with other associations) using a second-order fear-conditioning task (i.e., where a second-order condition is paired with a first-order condition, and a first-order condition is paired with an unconditioned stimuli). Their results showed that directly reactivated memories become liable to reconsolidation, but indirectly/associated reactivated memories do not. They argue that for a fear memory to undergo reconsolidation in the amygdala, it must be directly reactivated. Reichelt and Lee (2013) suggest that disruption of reconsolidation may be beneficial in the treatment of post-traumatic stress disorder (PTSD) and drug addiction, both of which are characterized by the presence of strong, repeatedly recalled memories. PTSD can develop after an individual experiences a traumatic incident. A typical characteristic of this disorder is that the subject keeps reliving the trauma through repeated and disturbing memories of the initiating event (Alberini, 2011). Alberini argues that antagonists of glucocorticoid receptors are some of the most effective compounds found to affect reconsolidation. Van Zuiden, Kavelaars, Geuze, Olff, and Heijnen (2012) suggest that development of PTSD may be preceded by deregulation of the glucocorticoid signaling cascade on various levels, (e.g., low circulation levels of cortisol shortly after trauma and a high density of glucocorticoid receptors in peripheral blood mononuclear cells). Most studies on reconsolidation and PTSD have been pre-clinical. However, Golier, Carmenica, DeMaria, and Yehunda (2012) recently carried out a clinical pilot study of combat-related PTSD that indicated that a seven day treatment with mifepristone was significantly more effective than a placebo, and that rates of remission were higher for the mifepristone group. There is strong evidence that the disruption of the reconsolidation process can have therapeutic effects on PTSD. The research is still at an early stage and more evidence is required. However, considering the prevalence of PTSD as a public mental health problem, it is well worth pursuing. Subjects would exhibit learned avoidance after being defeated by another hamster in the fighting chamber of the CAA, operationalized by a low mean position in the apparatus (i.e., further away from the dominant opponent) in the avoidance test after the defeat, compared with the pre-defeat trials (within-subject) and with the no-defeat group (between-subject). To investigate the role of glucocorticoid system in learned avoidance, mifepristone was administered after memory retrieval/reactivation (Avoidance Test 1). It was hypothesized that administration of a glucocorticoid antagonist would produce memory deficits during the subsequent memory test, resulting in a high mean position in the apparatus (i.e., closer to the dominant animal). The possibility of whether treatment is dependent on reactivation was also investigated by administering mifepristone to some subjects without reactivation (Avoidance Test 1). This is based upon research previously described, specifically Pitman (2011) and Taubenfeld et al. (2009). Thirty-six male Syrian hamsters (Mesocricetus auratus) were used in the experiment. They were 55 days old and were purchased from Charles River Laboratories. The hamsters were housed separately in polycarbonate cages (26 x 47.6 x 20.3 cm) containing pine-shaving bedding. Since hamsters are nocturnal and the experiments were run during the day, they were housed in a lab with a reversed 14:10 hour light/dark cycle. Temperature and humidity were checked daily in order to maintain the Animal Welfare Act standards. Presbyterian College’s Institutional Animal Care and Use Committee approved all experimental procedures. 10 Syrian hamsters (four to 26 months old) with previous dominant experience were used as dominant opponents. They had living conditions identical to the subjects, including the same light/dark cycle. In the first phase of the dominance training the hamsters were weighed and then the 10 largest were paired with the smaller hamsters. Each pair was placed in a testing area, which was the same size as the fighting chamber in our CAA (36 x 28 x 18 cm). The dominant hamster was picked based on interval observation (i.e., every 30 seconds for five minutes), with the following behavior categories: (1) dominant behavior (i.e., pinning, fighting and flank marking); and (2) subordinate/defensive behavior (i.e., teeth chattering, tail lifted, freezing, fleeing and upright/side defense). The criteria for completing the training and being used as a dominant was five consecutive wins, or more than five matches with over 80% wins. The match limit was 10 pairings. If the dominant hamsters fulfilled the criteria, they were paired up with their respective submissive partner and underwent two additional trials. In the second phase of the dominance training, the 10 dominant hamsters were randomly paired up with the submissive hamsters and run thought the dominance training again. The CAA is a sectioned runway with seven chambers and a fighting area. The dimensions of each section of the runway are 126 x 13 x 27 cm and the dimensions of the fighting area are 36 x 28 x 18 cm. Every section of the runway is divided by metal tabs that rise 5 cm above the floor in conjunction with Plexiglas sheets that extend 18 cm from the top of the chamber. This leaves a 5 cm gap between the metal tab and the Plexiglas sheet that allows the subject to move from one section to another. The entry to the start chamber is 28 cm wide. The CAA has an illumination gradient to establish a location preference. It ranges from a brightness level of 1500 lux in the start box to 1 lux in the fighting area. Additionally the apparatus is equipped with a fan in the starting box that pulls the air from the fighting arena, which spreads the scent of the dominant hamster to the alleyway. The testing room is lit with a red light, which does not interfere with the subject’s dark adaptation. The apparatus is automated with a program called Med-PC IV. This software is linked to the apparatus and the laser receptors in each of the chambers. The apparatus is fitted with low-power red lasers (500 mA) positioned in the middle of each section of the runway. Every time one of the lasers is interrupted by the subject, the timer starts for that specific chamber. MED-PC logs how many times the subject moves into the respective chambers by recording beam breaks. The program also times the experiment and signalizes when the trial is over. When the trial is over, the software computes the subjects’ average position along the apparatus. See Askew and González (2014) for a more detailed overview of the apparatus. Mifepristone (30 mg/kg) and the vehicle (propylene glycol) were purchased from Sigma-Aldrich USA. They were administered through subcutaneous injection with an 18-gauge needle. A smaller sized needle was not an option due to the viscosity of the vehicle needed. Subjects were matched using the pre-defeat mean position and then randomly assigned to one of the following conditions: (1) defeat, memory reactivation, and mifepristone (DRM); (2) defeat, no reactivation and mifepristone (DNM); (3) defeat, reactivation and vehicle (DRV); or (4) no defeat, reactivation and vehicle (CRV). Every subject had the same dominant opponent and the dominant’s weight was on average 27% higher than that of the subject’s (range difference: 18%-34% higher). The dependent variable was the mean position in the alleyway, calculated by multiplying the amount of time spent in each chamber by the chamber number, calculating the sum, and then dividing the sum by the duration of the trial. The current procedure has demonstrated learned avoidance in defeated hamsters, see Askew & González (2014) for details. Habituation trials. Subjects were placed in the first chamber of the CAA and could move around freely without the dominant present for four minutes. Pre-defeat trials. Two days after habituation trials, the subjects were exposed to the apparatus for four minutes with the dominant hamster present behind the barrier in the second half of the fighting chamber. Avoidance learning trials. Two days after pre-defeat trials, the subjects were exposed to either defeat (DRM, DNM and DRV) or no defeat trial (CRV). In the defeat trial the subject was placed in the start chamber. When they entered the fighting arena, the door to the arena was closed and the barrier that separates the fighting arena from the rest of the apparatus was removed, providing an opportunity for them to interact. The 5-minutes defeat trial began after the first flight behavior by the subject following a fight, or aggressive behavior by the dominant opponent. In the no-defeat trial, the barrier was not removed and the 5-minutes trial started when the door to the arena was closed. Avoidance test. Avoidance test trials were conducted two and four days after avoidance learning. The subjects were put through the same procedure as in the pre-defeat trials, except for the DNM group. Drug administration. Immediately after the first avoidance test, the DRM and DNM group were administered mifepristone, and the DRV and CRV were only given the vehicle. Data were analyzed using two-way analyses of variance (ANOVAs) for mixed designs, planned comparison tests, and post-hoc tests with Cronbach’s alpha level at .05. Four animals were dropped from the study since they failed to enter chamber eight (i.e., the fighting arena) during the pre-defeat trials. It was assumed unlikely that they would enter the fighting arena during the defeat trail and high levels of pre-defeat avoidance would make it difficult to show enhanced post-defeat avoidance behavior. To assess the effect of defeat on the avoidance measure (i.e., mean position), a two-way analysis of variance was conducted with Group (CRV, DRV) as the between-subjects factor and Day as the within-subjects factor (Pre-Defeat, Avoidance Test 1, Avoidance Test 2 and Avoidance Test 3). Mauchly’s test indicated that the assumption of sphericity had been violated (χ2(2) = 17.48, p = .004), therefore degrees of freedom were corrected using Greenhouse-Geisser estimates of sphericity (ε = 0.60). Main effects of Day, F(1.787, 23.23) = 7.88, p = .003, ηp2 = .377, and Group, F(1, 13) = 10.90, p = .006, ηp2 = .456 were qualified by an interaction between Day and Group, F(1.787, 23.23) = 6.37, p = .008, ηp2 = .329. Planned comparisons were conducted to investigate the specific differences proposed in the hypotheses. Figure 1 shows the significant differences between the CRV and DRV Avoidance Test 1, and between the DRV pre-defeat and Avoidance Test 1. For the DRV group, the mean position in Avoidance Test 1 (M = 3.0, SD = 1.3) was significantly lower than pre-defeat (M = 5.6, SD = 1.4), F(1,7) = 27.87, p = .001, ηp2 = .799. Similarly, the mean position for the CRV Avoidance Test 1 (M = 5.8, SD = 1.1) was significantly higher than the mean position for the DRV Avoidance Test 1 (M = 3.0; SD = 1.3 s), F(1,13) = 18.32, p = .001, ηp2 = .585. Mean position in alleyway before and after defeat. 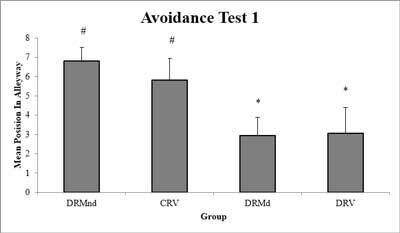 The animals in the DRV group in Avoidance Test 1 had a significantly lower mean position compared to the CRV Avoidance Test 1 (#p < .001) and the DRV pre-defeat (*p < .001). Half of the DRM group failed to show signs of learned avoidance after the defeat trials. The DRM group was therefore revised to two even groups (N = 4 in each), respectively DRMnd (defeat, reactivation, mifepristone and no observed defeat) and DRMd (defeat, reactivation, mifepristone and observed defeat). The criteria for DRMnd was that the mean position increased after defeat (i.e., closer to the dominant hamster), and for DRMd that the mean position decreased after defeat (i.e., closer to the start box). Using the revised grouping, we conducted a two-way mixed analyses of variance, with Day (within-subject) and the revised Group (between-subject). The analysis yielded a significant effect of Day, F(2,38) = 9.94, p < .001, ηp2 = .343, Group, F(3, 19) = 5.23, p = .008, ηp2 = .455, and the interaction, F(6, 38) = 9.32, p < .001, ηp2 = .595. Using our revised grouping, we conducted a one-way analysis of variance (ANOVA) to assess the effect of Group for Avoidance Test 1 and found a significant effect, F(3,19) = 15.45, p < .001. Post-hoc tests were conducted using Bonferroni corrections. The mean position for DRMnd was significantly higher than the mean positions for DRMd (p = .001) and DRV (p < .0001). The mean position for CRV was significantly higher than the mean positions for DRMd (p = .004) and DRV (p = .001). No other differences were significant (Figure 2). Mean position in alleyway after regrouping DRM in Avoidance Test 1. The mean positions for the DRMnd and CRV groups (#p < .001) are significantly higher than the DRMd and DRV groups (*p < .001). The mean position data for the DRMd and DRV groups in Avoidance Test 1 and Avoidance Test 2 are presented in Figure 3. Given that the mean positions for these groups on Avoidance Test 1 were not significantly different (see above), a comparison of the mean position data for Avoidance Test 2 would indicate whether the drug had an effect during reactivation. However, the post-hoc analysis failed to yield a significant difference, t(10) = 1.05, p = .320. Mean position in alleyway for the DRMd and DRV groups in Avoidance Test 1 ans Avoidance Test 2. No significant differences were found between the groups in Avoidance Test 1 and Avoidance Test 2 (p > .05). The DNM condition was included in the experiment to determine if the drug had an effect without reactivation. Without reactivation effects, there was no clear way of interpreting the DNM data. Therefore, the DNM data were not analyzed. 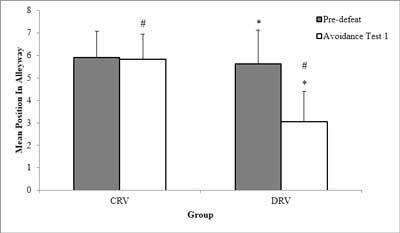 The DRV group had a significantly lower mean position compared to the CRV and the mean position in post-defeat was significantly higher than in the pre-defeat in the DRV group. These results are consistent with previous findings from Huhman (2006). These findings indicate that hamsters that were previously defeated by a larger and more aggressive male avoided and showed defensive and submissive traits to that hamster in the aftermath of defeat, as well as to other smaller, non-aggressive hamsters. Furthermore, Lai and Johnston’s (2002) results are consistent with the current findings in that they showed that rats spent significantly less time near their dominant opponent as a result of an aggressive encounter. A recent experiment conducted with the CAA also yielded results consistent with the current findings, as the subjects had significantly lower mean positions after defeat (Cullum & Askew, 2012). Half of the DRM group did not show defeat. One possible explanation is the age of the subjects. Ferris, Messenger, and Sullivan (2005) describe how hamsters in adolescence may commonly lose fights, due to the fact that they have not fully developed the size, strength and social behaviors needed to compete over mates, food and territory. If this repeated defeat pattern results in a stable submissive phenotype, these hamsters might never have the opportunity to mate. Ferris et al. (2005) showed accordingly that adult hamsters that had a history of submission in adolescence can still be very aggressive toward other male hamsters. They argue that adolescence may represent a resilient period, which protects the hamsters until they reach adulthood. Based on this argument, it is possible that some of the hamsters in the current study were too young and consequently too resilient to successfully learn social avoidance. How learned avoidance relates to age is therefore something that should be examined in follow-up studies. Another possible explanation is that defeat in the current study was not severe enough to induce fear learning in the subjects. The subjects were defeated once in a 5-minute encounter with a dominant hamster, which is grounded in previous research (Huhman et al., 2003). Lukas et al. (2011) argue that exposure to a single social defeat is efficient in inducing social avoidance in male rats. However, this exposure lasted 30 minutes rather than the five minutes in the current study. Jeffress and Huhman (2013) tested the difference between one single 15 minute defeat (termed an acute defeat) and 5-minute defeats repeated nine times in Syrian hamsters. Their outcomes showed that repeated defeats resulted in significantly more submissive behavior compared to no-defeats and that there was no significant difference between no-defeat controls and acutely defeated subjects. This is interesting since Huhman (2006) has previously argued that conditioned defeat can occur in 15 acute defeats (see also Huhman et al., 2003) and in the current study, learned avoidance was obtained with five minute defeats. Inducing both a defeat that is longer and repeated defeats should therefore be investigated in future research. As stated in the result section, the DRM group was divided into two groups grounded in the Bonferroni corrections: those that showed some evidence of learned avoidance (DRMd) and those that did not (DRMnd). Furthermore, the lack of significant difference between the DRV and DRMd groups for Avoidance Test 1, and the significant difference between the DRMd and CRV groups for Avoidance Test 1 support the revised grouping procedure (Figure 2). 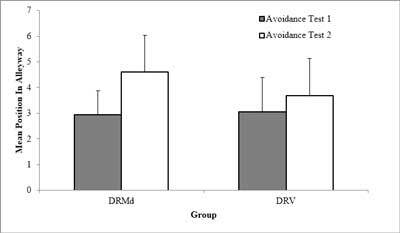 Figure 3 displays similar data for both the DRMd and DRV groups at Avoidance Test 1, and the difference for Avoidance Test 2 was not significant. Even though the results failed to show any significant drug effect, previous research on glucocorticoid antagonists, such as mifepristone, has achieved a significant drug effect. However, this research has used a simpler form of fear learning (e.g., electric shocks) and also different rodents, such as rats (Taubenfeld et al., 2009; Tronel & Alberini, 2007; Walters & Abel, 1971). Deębiec et al. (2006) argue that the disruption of complex fear memory could be difficult, as reconsolidation seems to occur only if the memory is directly activated and therefore the process may not be disrupted. This could be because indirectly activated memories involve weaker associations and thus do not produce sufficient stimulation to the memory network to engage signaling pathways that lead to protein synthesis. This might suggest that disrupting reconsolidation in complex contextual situations could be difficult, since it produces specific rather than broad changes in memory and its associations (Deębiec et al., 2006). It is possible that inhibition of the glucocorticoid receptors is not as effective in disrupting reconsolidation on this type of fear learning, or that mifepristone itself is not efficient in doing so. It should also be noted that an effective dosage on rats might not be transferable to Syrian hamsters. Furthermore, the use of 18-gauge needles in the administration might have added to the overall stress level experienced by the hamsters, increasing glucocorticoid levels additionally and consequently overpowering any possible drug effects. Others have successfully used intra-amygdala injection (i.e., to the basolateral amygdala) in studies concerning reconsolidation and mifepristone (Jin et al., 2007; Wang, Zhao, Ghitza, Li, & Lu, 2008). This has been done with an intracranial cannula, which involves habituation training of the injection procedure and therefore leads to less stress during the actual experiment. However, it should be noted that the cost and complexity of such a study is considerably higher, and that it is only assumed that reconsolidation occurs in this type of fear learning. The data plotted in Figure 3 suggest that a drug effect is plausible, since the sample size of the drug group may have been too small. Therefore, the result may be underpowered and, due to a lack of statistical power, it would be hard to detect the effect of the drug, even if it was real. A significant effect of learned avoidance was found following defeat in the CAA. Nevertheless, no evidence was found to suggest that mifepristone altered learned avoidance in terms of significantly increasing the mean position in the apparatus compared to the control group (between-subjects), or the mean position before injection (within-subject). Possible explanations for the lack of a drug effect are the subjects’ age, use of a single defeat instead of repeated defeats, the complexity of this type of learned fear, issues concerning the method of drug administration, and/or that glucocorticoids may not play a significant role in modulation of this type of fear memory. Based on the results of the current study, it may be of interest to carry out follow-up studies that investigate the subjects’ age, type of defeat, dosage and injection types in relation to learned avoidance. We would like to express special thanks to Professor Fernando González for building the apparatus and helping with the experiment. In addition, we thank Det Cullum and Michael Hanna for their contribution to the research. Cullum, D. and Askew, A. (2012). Learned Avoidance in the Male Syrian Hamster, [PowerPoint slides]. Retrieved from http://goo.gl/IIqYoz.